Please enter personalization information exactly as you want it to appear. 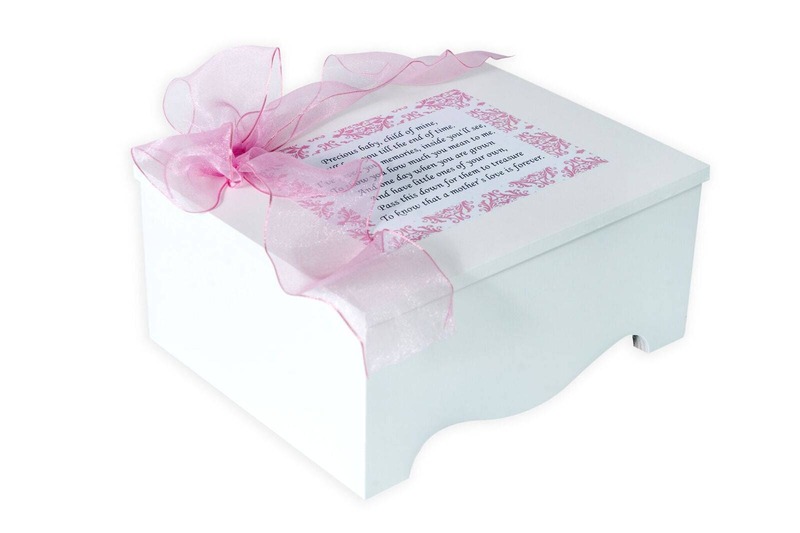 Made in the USA, this birch wood baby keepsake box is adorned with a precious baby poem written by Dawn DiFiore and an organza ribbon and may be personalized with your child's name or 3 -letter monogram. The keepsake box includes a first tooth and lock of hair envelope on the inside and has a fabric liner in the bottom. Lift off lid. Box measures 10" x 8" x 4.5" on outside and interior measures 8.5 " x 6.75 " x 3.00". Please specify if you'd like it to be personalized in the comments section at checkout. Thank you so much. This is beautiful. I love it! Can't wait to give it as a gift on Mother's day!